We know that seven out of ten UK researchers reported that their work would be impossible without software, but, sometimes when attending domain specific conferences, we still get surprised at the importance of software in research. On June 2018, I attended Measuring Behavior 2018 by invitation of our fellow Robyn Grant. Measuring Behavior 2018 was a three-day conference hosted at the Manchester Metropolitan University and covered analysis methods for behavioral data, techniques for human factors studies, mazes and behavioral tests, sensors for measuring behavior, extracting behavior from audio-video streams and a few other related topics. We could tell that behavioral researchers are relying more on software every year because the atrium had a dozen of stalls from companies, such as Noldus, and organisations, such as the National Centre of the Replacement, Refinement & Reduction of Animals in Research (NC3Rs), offering software and hardware solutions to assist behavioral researchers when, for example, monitoring animals in a maze or tracking the eyes of certain subjects. Many talks presented during the conference explicitly mentioned the use of software to assist with the collection or processing of data. Here we mention some highlights. Claire Witham described her collaboration to incorporate machine learning software to recognise one monkey in a group of 15 living together and to track how close two monkeys are from video recording. The software was as good as face recognition on your camera phone. The project’s challenge was that monkeys are constantly moving so the camera loses track of the animal many times mainly because the video regularly doesn't show the complete face of a monkey. Zebrafish are very popular in research, especially in medical research. 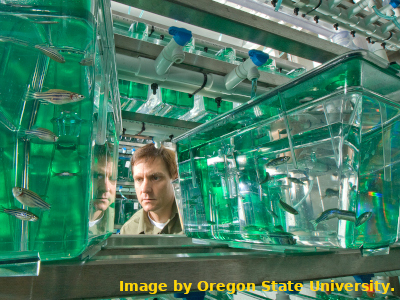 All groups that use zebrafish on their research have a big room with many fish tanks dedicated to the zebrafish, like the one in the image below. Lynne Sneddon mentioned that something that can lead to wrong results in a study is the use of ill zebrafish as subjects. Researchers already know some of the indicators of illness in zebrafish, but monitoring hundreds of fishes in a facility 24/7 is a task that only computers can do. Lynne showed us very promising videos though, and hopefully all laboratories will be using similar software to monitor their specimens. Zuzana Zajková et al. use the geographic information system (GIS) generated by seabirds that, except during breeding season, live further away from land. Maps and other visualisations on Zuzana’s presentation were created in R and looked amazing. Karl Bates gave a keynote on how the study on dinosaurs' behavior is based on birds' behavior and morphology. With the help of software, researchers could model the walk of a Tyrannosaurus rex and, though disappointing for fans of Steven Spielberg's Jurassic Park, find out that T-rex couldn't actually run. Karl explained, for example, that before having access to modelling software, the estimation for T-rex speed didn't consider many constraints such as bone dynamic support. Can Research Software Engineers help measuring behaviour? At Measuring Behavior 2018, Dr Caroline Jay and I leaded a gathering information session related to Research Software Engineers and their contribution to behavioral sciences. Around 20 attendees participated in this session and the information collected will be used to write a report. 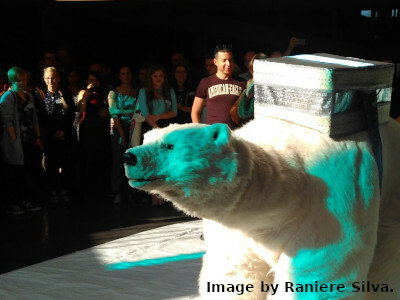 Measuring Behavior 2018 was a fantastic conference—we received the visit of Bjorn, the polar bear; you can see his picture at the top of this post—where we could see some cases where software plays an important role to make not only researchers and research better but also improve the life of our society. The next Measuring Behavior conference will happen in 2020 in Krakow.